A beautiful 3 mm natural gray felt case to celebrate the creative in your life. Pair this with an adult coloring book to make a complete gift! Have a creative type in your life? Celebrate their unique talents with a beautiful and functional gift that will protect their tools, paint brushes, pens and pencils wherever they go. This felt case has the timeless beauty of felt with a smart roll up design that makes it easy to carry. Pens, pencils, brushes, and other tools can be inserted securely into its 12 slots. The case features a red elastic string and button for secure fastening. 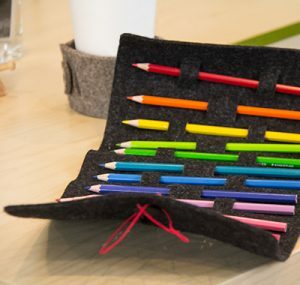 Made from natural wool, our felt pencil case provides superior cushioning for fragile materials with 3mm thick felt. Felt is made through a process where heat, moisture, and pressing are applied to natural fibers or a blend of natural and synthetic fibers. This causes the naturally curly fibers to interlock and form a dense, resilient textile. The result is an incredibly durable fabric with a soft tactile feel. Not only is felt an environmentally sustainable material, but it’s also naturally water-resistant and durable. In fact, felt will retain its shape over decades and will neither fray nor wear easily. It’s a stylish yet practical tool for artists on the go. The felt pencil case is easy to spot clean using cool water. Pair it with an adult coloring book for the ultimate gift!